Going back to childhood haunts can be tricky. Places change, not always for the better, and it can be a gross deception if your once favourite place has turned into a mega Tescos, or worse... (if possible). Last year I went back to visit Mumbles, with the boys. My mother used to live on the other side of the 'Welcome to Mumbles' sign, and we spent many summers on the various beaches there when we went to stay with my grandmother. Going back turned out to be a brilliant idea. Mumbles had got better, cleaner, and more active. The Lido, from being a stagnant boating pool, had become a clean, exciting paddling pool, with fountains, water chutes, islands and jacuzzis. It was clean and safe, and had a playground attached with climbing wall. The weather was not conducive to lounging about on beaches, so instead, we visited ruined castles. Driving into the heart of Gower, we started off with Weobly castle. It was raining, so the whole place looked authentically dark and dank. The boys dashed off to see what they could clambour over, climb on, and fight in, finding hidden niches and spooky staircases. The view was spectacular, looking out over the marshes, where sheep graze and get turned into salt marsh lamb. My mother bought some, and we ate a shoulder for our last evening there. It was exquisitely fragrant meat; very tender, and totally delicious! After Weobly, we went to Oxwich castle which has a super shop. For young boys, that is... They were selling faux chain mail tunics and wooden swords. My youngest fell in love with the tunics, and I succumbed to his desire, together with swords for both so they could battle it out with panache! My youngest would have gone to bed in his tunic, had I let him! It was definitely his favourite holiday purchase. We visited Oxwich in clearer weather. 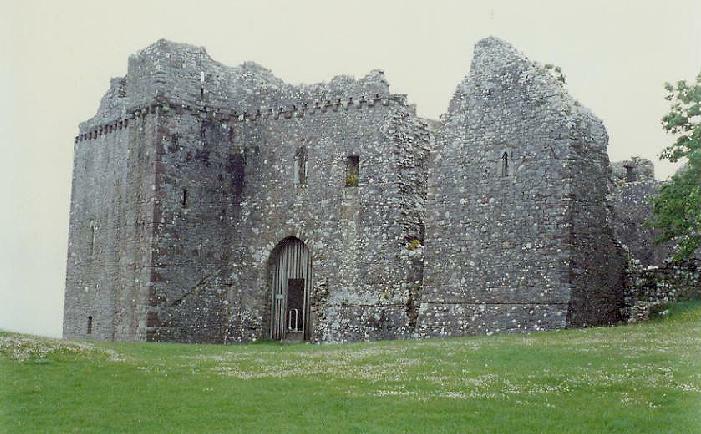 It is a more recent castle than Weobly, dating back only to the 16th century, and was more a mock-fortified manor house than a working stronghold. There was an interesting exhibition of Welsh history in the gallery explaining the invasions from the west and east, as well as the interminable inter-kingdom wars. 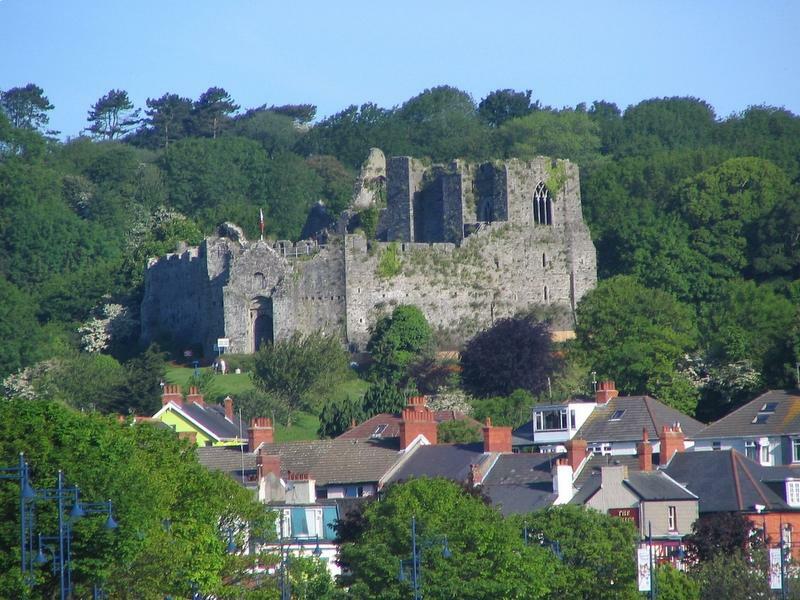 Our last castle was Oystermouth, in Mumbles - our local. It dates back to the 13th century and is set magnificently on a hill where, today, plays are put on in the natural amphitheathre, together with son et lumiere events. There are fantastic views over Swansea Bay, especially down towards Mumbles; the pier, the lighthouse, the old lifeboat house. We climbed up onto the ramparts, the boys charging their way around wielding their swords in a suitably medieval way. This year, then, was the year of the castle. Last year was the year of the beach. What will next year bring? I'm usually able to sus out your punning titles, Sarah, but this time you have me well and truly stumped. The Gower Peninsula is a marvellous spot - Britain's first national park as I recall. We took the kids there when they were small, staying at the old-fashioned Oxwich Bay Hotel. Just don't mention Swansea market's laverbread. Well, I was in a bit of a rush last night to finish off the post, especially as House was just about to come on, so didn't think to long and hard about a title. It's a sort of reference to the 'Outsize Me' from that prog on eating MacDos for a month. We were full of castles, if you like. If it's that obscure, I'll change it. I'm not a fan of laverbread either, but I love cockles! Right, I'm with you now Sarah. The allusion escaped me, if only because your "over-dosing" on castles was an educational experience for the kids. That's a world apart from Supersize Me, or whatever it was called, mere mention of which gets me near-apoplectic with rage. I cannot for the life of me understand how it was ever accepted for grown-up television, or that it was supposed to convey any useful nutritional lessons. Don't get me wrong - I'm no fan of fast food, and certainly no apologist for MacDonalds and their ilk. So a grown man deliberately gorges on over 5000 calories a day, twice his energy needs, taking all the two-for-one offers, claiming that is what the average adolescent would do. He then gets indignant and vindictive because he piles on the pounds, and develops a fatty liver. He tries to make out he's the victim of a fast-food 'drug pusher'. Grrrr. Appalling, dumbed-down TV - the absolute pits. His programme was nothing but a self-serving stitch-up of an easy target and should have been left on the cutting-room floor. Mmmm. I've been wanting to say that for a while, and feel a lot better now. Now was that you were saying about cockles? Love 'em myself, but then I love anything pickled or vinegary. Ah, well, I never actually watched the programme, myself... I just found the title catchy. I'm glad you got that off your chest, though! 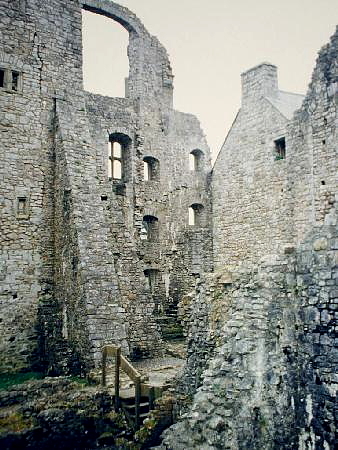 There are some cracking castles within a drive of Swansea as well. Kidwelly's got great dungeons, Dryslwyn and Dynevor have magnificent hilltop sites, but best of all is Carreg Cennen with its tremendous views and its cave passage. We're off to Gower next week and I've just bought a surfboard. For the children, of course. Thanks for the tips, Laban, and I hope you have a fabulous holiday there too. The surf was great when we were there!